3x VOSS.farming Gate Handle Insulator "Horn"
Fixed gate handle insulator with two suspension eyelets. Suitable for gate handles with hooks and eyelet. 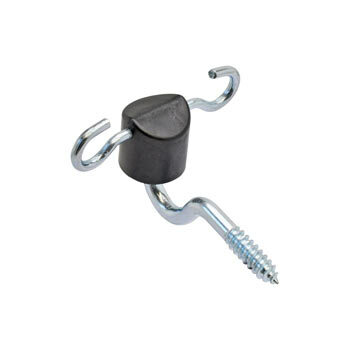 Very robust gate insulator, with mounting hooks – does not rotate. Suitable for mounting gate handles and conductive material. With two, 360°-rotatable, suspension eyelets. Practical and safe to use, an important gate component. 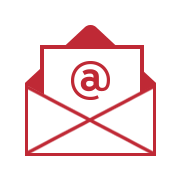 Practical and safe to use, an important gate component. Fence lengths. Our highest-quality gate handle insulator, all metal parts made entirely from stainless steel. With extra-long and strong support for the highest level of stability. With two, 360°-rotatable, suspension eyelets, made of stainless steel. Practical and safe to use. Suitable for many uses, e.g. gate systems, fence beginnings, etc. With metric M6 thread and two nuts. Suitable for mounting all types of gate handles. Gate insulator with stainless steel plate and 3 connection options. 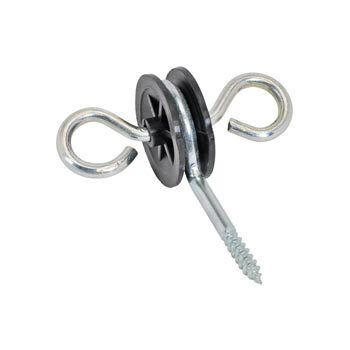 Suitable for mounting gate handles, connecting fence supply cables, branching fences, fixing conductive material, etc. 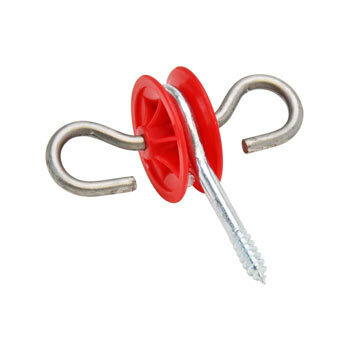 Professional gate insulator: for connecting fencing tape, as a gate handle mounting option, for connecting energiser cables, tape branches, beginning insulator, etc. Optimal current flow and fixes fence materials without damaging them. Very robust gate handle insulator with galvanised connecting plate! 10 x gate handle insulator with connecting plate. With solid, galvanised metal plate and fixing screws. The fact that an electric fence is electrified offers many advantages and makes it safer than any other fence system for the field or garden. However, due to the electric current, it’s important to proceed appropriately, pay attention to safety and not to overlook important components such as electric fence insulators. This is also of particular importance where the gate is concerned. 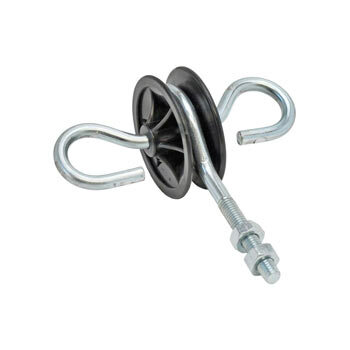 In terms of insulation, special gate handle insulators can be purchased for electric fences. What is important where gate handle insulators are concerned? The success of an electric fence depends on three components: Firstly, the energiser must be powerful enough and chosen in such a way that, if located near a building, it can be connected to the mains power supply, or if out in a remote field, it can be operated by a rechargeable battery unit or battery. Secondly, coordinating fence posts must be erected; wood or metal are recommended for permanent fences and plastic or fibreglass for mobile electric fences. Thirdly, the conductors play an important role as they conduct electricity. Electric fence tape is highly popular, but rope, polywire and wire are often used instead. Insulators designed for tape, polywire, rope or wire are connected to them. An exception to this is the electric fence gate which is essential for access. Special gate insulators and gate handle insulators are used for this, as the gate is a critical point in the fence system. Finally, safe and easy access should be provided, on the one hand, while ensuring continuous safety, on the other. 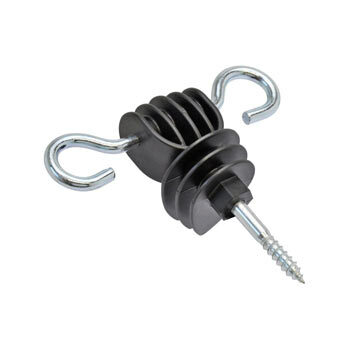 Electric fence gate handle insulators exist for this purpose and are available in practical kits to meet high demands. Just as there are various conducting materials and gate handles, you can also choose from a wide variety of gate handle insulators. We recommend a permanent gate handle insulator with two suspension eyelets which can be attached quickly and fits well. 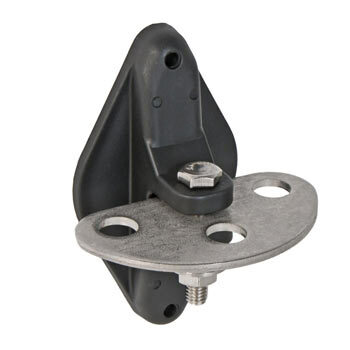 As the suspension hooks on this type of model cannot be turned, this ensures a firm hold. Gate handles and conductors can be mounted without any difficulty. 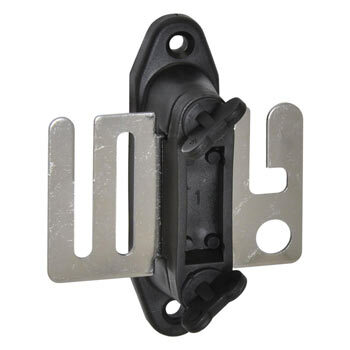 Alternatively, rotatable gate handle insulators are also available. The metal parts are generally made of rust-free stainless steel, while the main part of the insulator is made of UV-resistant, hard-wearing plastic. 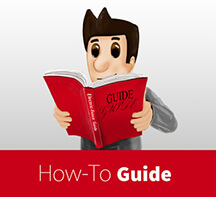 If you choose a model with an extra-long support, this will ensure a high level of stability. We also highly recommend gate handle insulators with a metric thread. 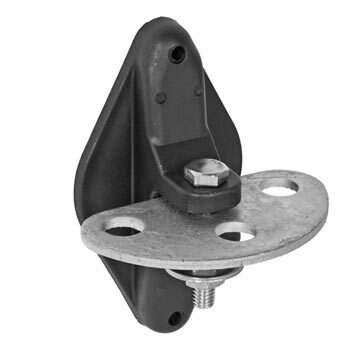 The same applies to safe anchor insulators with a metal base, and triple gate insulators with a galvanised connector plate. It’s important to ensure that the gate insulator matches the conducting material. For example, tape insulators have a completely different structure to electric fence gate handle insulators for polywire and rope. A large electric fence gate handle insulator with a ground terminal strap is a suitable option for broad fencing tape.